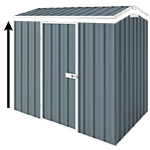 This Spanbilt Double Flat Roof ZINC Carport is 5.9m x 5.5m. It's great for keeping your car under cover and safe from the strong Aussie sun or hail. Product arrived when promised,well packed for transport .Nothing was missing.Sections fitted together well.Plans fairly easy to read. Plenty of communication between cheap sheds and myself. Great service, great product, could not have expected more. From order to collection very efficient and very smooth transaction. The carport is good quality and exactly what I wanted. Thank you for contacting us Dennis. This one only goes up to 2.4m but the Smartbilt Double Carport with flat roof has two additional hight options, 2.4m as well as 2.7m. Feel free to let us know if you have any more questions. Hi to CS team,Am preparing to install one of the Yardpro double carports, with flat roof-& size 5.9m x 5.5m, in zinc steel. What might be the installation time for 2 competent handymen working together on this, based on it sitting on concrete slab?Thanks. The installation time for one of our YardPro Flat Roof Double Carports (5.9m x 5.5m) is approximately 6 hours but this could still vary depending on the experience of installers. I hope this helps and please let us know if you have any other questions. Thank you.